United Renewable Energy LLC has completed construction of the first Community Solar Project interconnected to National Grid in New York state. The project is located in Northern New York, in the Hamlet of Somerville, on approximately three acres of underused pasture land. The solar photovoltaic modules peak output is 241 Kilowatts DC, yielding a peak of 165 kilowatts AC returned to the power grid. Elizabethtown, NC, December 5, 2016– United Renewable Energy LLC and Cypress Creek Renewables are pleased to announce the completion of a 7 MW solar photovoltaic facility located in Bladen County, NC. The project was completed in a partnership between United Renewable Energy LLC, which completed the development activities, and Cypress Creek Renewables who acquired and constructed the facility in late 2015. The 7 MW facility provides solar energy to Duke Energy Progress through a Power Purchase Agreement and is located on approximately 30 acres of land. This is one of the first solar projects constructed in Bladen County, NC, but many more have recently been announced. Solar projects offer competitive lease rates for landowners, benefit the local property tax base, and provide local jobs to assist with the construction and operation of facilities. “We are proud to work on this exciting project with Cypress Creek Renewables, one of the largest and fastest growing independent power producers in the world. 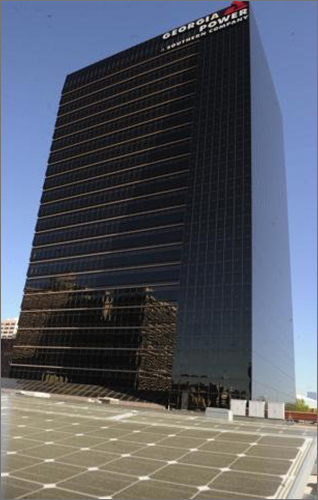 Their focus and strict adherence to high quality standards are an excellent fit for our developed projects. ” said Keith Herbs, Executive Vice President of United Renewable Energy LLC. EATONTON, Ga., Oct. 6, 2016 /PRNewswire/ – Tri-County EMC, a member owned electric co-op, is proud to announce commercial operation of a one megawatt (MW) community solar electricity generation farm in Eatonton, Georgia. The project was developed jointly between Tri-County EMC, Georgia Power and United Renewable Energy LLC. Tri-County EMC provides the low cost solar energy to its participating member-owners as a credit on their bill. Tri-County EMC was formed in 1939 by farmers and homeowners in Baldwin, Jones and Putnam counties and currently serves five additional counties, totaling more than 21,000 accounts. As a co-operative utility, it is owned by its members receiving electric service. Third phase of Dalton Solar Plant now online. 7 MW of new solar energy now flowing to Dalton Utilities ATLANTA, May 13, 2015 /PRNewswire/ — Leaders from Georgia Power, Southern Wholesale Energy, United Renewable Energy LLC and Dalton Utilities gathered this past week for a ribbon-cutting ceremony to mark the latest expansion of the Dalton Solar Plant in Dalton, Ga. With more than seven megawatts (MW) of new generation capacity, this expansion adds to the approximately 700 kilowatts from two previous phases, which came online in 2011 and 2012, respectively. SUMMERVILLE, Ga. — Even under Thursday morning’s overcast skies, the new 1,400-panel solar array perched on the roof of a Mohawk Industries building was generating power. The array can produce up to 628,000 kilowatt-hours a year, roughly enough to power around 55 homes annually. The project was a coming-together of flooring manufacturer Mohawk, clean energy firm Constellation, solar infrastructure firm United Renewable Energy LLC and utility provider Georgia Power. Officials from all four were on hand Thursday morning to celebrate the new array’s unveiling. Solar panels installed on land owned by the Stephens County Development Authority are up and running. 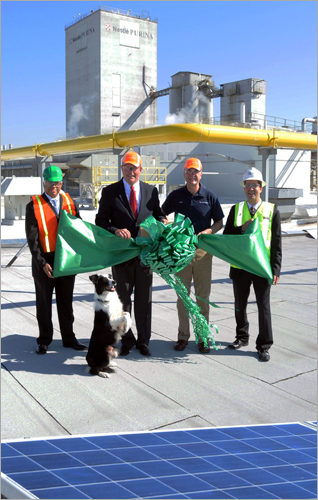 FAIRBURN, Ga., May 8, 2013 /PRNewswire/ — Nestle Purina PetCare today unveiled the Company’s largest solar array at its Atlanta pet food manufacturing facility. The solar array, designed and installed by United Renewable Energy (URE), represents the latest step in Nestle Purina’s commitment to environmental sustainability. Fairburn Mayor Mario Avery joined a Nestle Purina delegation, as well as representatives from the offices of U.S. Senators Saxby Chambliss and Johnny Isakson and URE on the factory’s rooftop during a dedication ceremony for the nearly 1,900 glistening solar panels. Dalton Utilities, in partnership with Georgia Power, has created a solar plant located on Dalton Utilities’ property. All of the renewable energy credits will become the property of Dalton Utilities. The initial phase of the plant, located on Looper Bridge Road in Dalton, went online in 2011. Construction on the second phase was completed in late March. 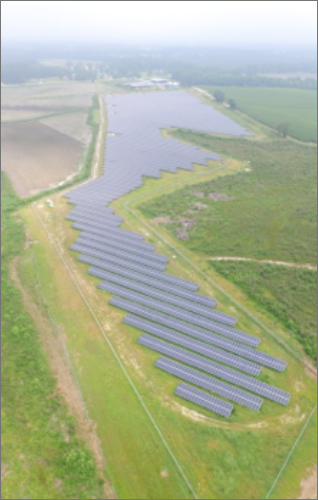 The first two phases consist of more than 3,100 fixed-tilt solar panels and provide a combined capacity of approximately 700 kW, enough energy to power 95 homes. Georgia Power Co. will begin construction soon on a project that will double the generating capacity of the utility’s solar plant in Dalton, Ga., the company announced Thursday. The first phase of the plant went on line last March and is operating with a capacity of 350 kilowatts. Construction of the second phase, due to be completed in about two months, will bring the plant up to 700 kilowatts, on its way to a full capacity of 1 megawatt of electricity. One megawatt of solar photovoltaic panels produces enough energy to power about 135 homes. The plant is being constructed by United Renewable Energy LLC of Alpharetta, Ga., under a 25-year wholesale power purchasing agreement Dalton Utilities signed with Georgia Power in January of last year. Dalton Utilities serves 77,000 customers in five Northwest Georgia counties. Georgia Power is a unit of Atlanta-based Southern Co . (NYSE: SO).